Ex-White House Press Secretary Sean Spicer Finally Meets Pope Francis : The Two-Way When President Trump visited the Vatican in May, Spicer was left off a list of White House officials who had a chance to meet the pope. Spicer resigned as press secretary on July 21. 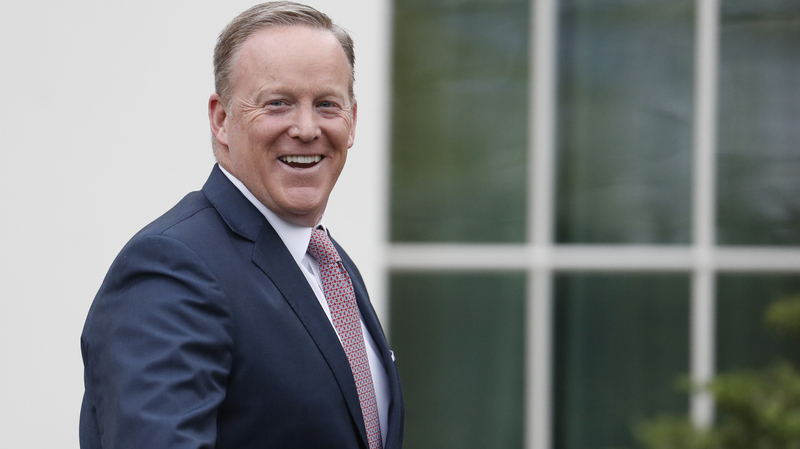 Outgoing White House press secretary Sean Spicer smiles as he departs the White House on July 21. Earlier that day Spicer resigned his position. Former White House Press Secretary Sean Spicer, who is Roman Catholic, finally got his chance to meet Pope Francis. Spicer was at the Vatican over the weekend as part of an annual meeting of the International Catholic Legislators Network. The nonpartisan group brings together lawmakers from across the globe to discuss the promotion of Christian principles in politics. Vatican spokesman Greg Burke has confirmed that Spicer attended an audience with the pope on Sunday. When President Trump visited the Vatican in May, Spicer was left off a list of White House officials who had a chance to meet Francis. "The group included the president's family members, Secretary of State Rex Tillerson and two more State Department officials, communications adviser Hope Hicks, bodyguard-turned-White House official Keith Schiller and social media director Dan Scavino. "At the time, some White House watchers speculated that Trump purposely left out his press secretary, who was on shaky ground. And many commentators said they felt bad for Spicer, who attends Mass regularly and would have been deeply moved to meet the pope." White House officials said at the time that Spicer was not on the list due to a number of constraints from the Vatican, according to USA Today. "In announcing the audience Sunday morning, the Vatican press office said the pope gave a "brief greeting" to the 250 or so participants gathered in the Clementine Hall, one of the main reception rooms in the Apostolic Palace. "It didn't release the full text of his remarks, but both Vatican Radio and the Vatican newspaper, L'Osservatore Romano, said the pope delivered a message that included his usual call for lawmakers to "build bridges" between different political perspectives." Spicer resigned as press secretary on July 21 as part of a White House communications shake-up.